I'm Erin Chesnut and I've been a scenic carpenter at the Oregon Shakespeare Festival for the past 7 years. I started working at OSF when I was barely out of college. At the time, I had one year of carpentry experience in a tiny theatre company that numbered 15 people from the artistic director down to me, the carpentry intern. Going from that to OSF, a company of hundreds of talented theatre professionals, was quite the culture shock. We've been talking about an exchange program for artisans since I've been with OSF. When the talk became reality with funding from an A Ha! grant, I leapt at the chance to spend some time out in the world. I wanted to see how another large company builds their scenery and goes about the business of theatre. I've just spent 4 weeks working in the scene shop of The Shakespeare Theatre Company in Washington, DC, helping build the last show of their season, Noel Coward’s Private Lives. During my time in DC, I have paid attention to the work organization and storage systems. They are a revelation. There are many similarities between The Shakespeare Theatre’s physical space and OSF’s new production shop in Talent Oregon. Both are large, located across town from the theatres and built on a concrete slab. This is opposed to OSF's current shop which is near the theatres, too small, and on the second floor of an older building. The DC shop is in a pre-existing warehouse space. It's a little bigger than our current production space in Ashland but with fewer than half the people working in it. It has high ceilings and a concrete floor that can accommodate a forklift. It has been enlightening to learn the difference a forklift makes in the storage options and work flow. 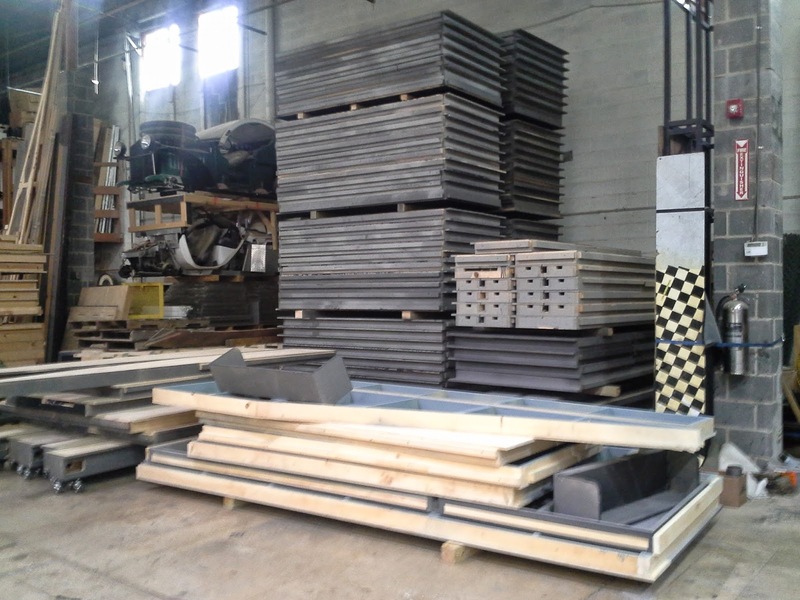 Here's a picture of their newly restocked pile of stock flooring - that's 80 4'x8' platforms, 2,560 square feet of flooring stored in a 72 square foot footprint. That is more than twice as efficient as we can manage by hand in our current shop. Much of the odd sheet goods and random accumulations of gear that breed in a shop are stored on high shelves, preserving floor space but still easily accessible with the forklift. 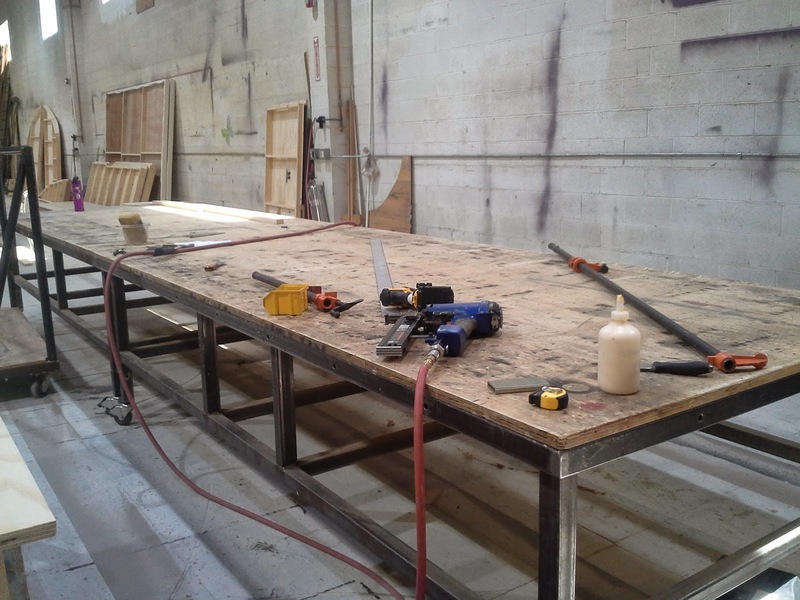 One of the big floor space debates we have at OSF is about work tables. We don't have any, and we don't have the room for them in the current space. But in the new shop... Here in DC, there are 4 carpenters and each has a set of two 5'x10' work tables. Here's a picture of mine. There are a couple spare tables which the bosses use for smaller projects and their sawhorses are the same height as the tables. 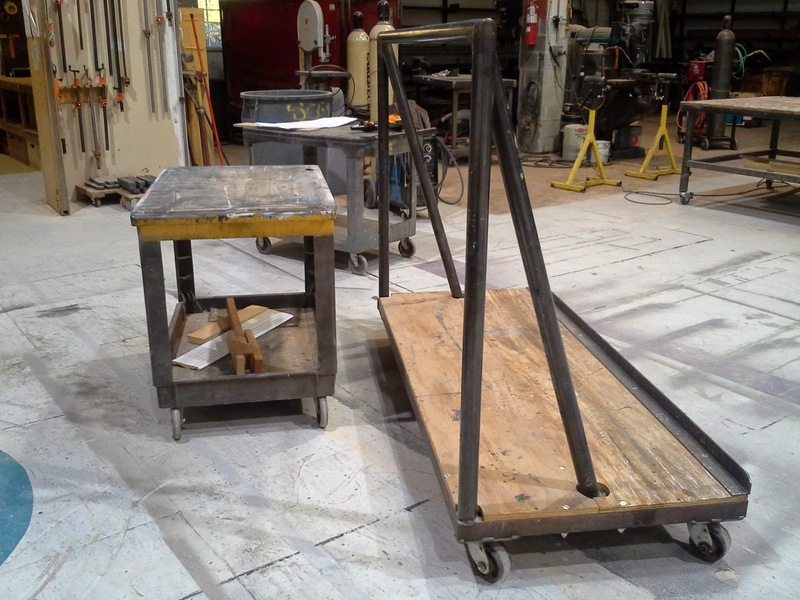 There are dedicated carts for moving material around the shop. These carts do no leave the shop and are not used to store scenery. Carpenters use them to collect and move lumber from the racks to the saws or work spaces. These two simple carts are my new favorite tools. The biggest surprise of this trip was delivered by the pedometer app on my phone. I've had it running in the background for months and thought that I would set records on it during my time in DC; all that sightseeing, living without a car, etc. Shockingly, my highest count days in DC have been the same as an average day in Ashland. Turns out walking 2+ miles and through the entire Smithsonian, or working 10 hours each work day and walking to the metro, neither one can hold a candle to the amount of walking I do on an average work day in the OSF shop. I've often joked that I spend a lot of time at work walking in circles. It turns out that I really do. I don't walk as much in this shop thanks to the giant work tables and lumber carts. Instead of doing endless laps carrying lumber and fetching tools out, I can gather what I need, wheel it all to my table, and work. I always knew work tables and carts would save our knees and backs, but I had no idea how much it would affect our mileage. This exchange has given me all sorts of great ideas about storage and setup options for the new shop. Now to get home and start planning our new reality in that big, shiny, new building. I have never spent time in the northeast, so this exchange was a great opportunity for cultural exploration. The sheer number of museums in the city is overwhelming. I've gone through 10 or so and still have more I want to cram into the last days of my trip. My favorite bits thus far have been the First Ladies exhibit in the American History Museum and Julia Child's kitchen. The Portrait Gallery/American Art Museum is also incredible. If I lived in the district, I would come back to the Portrait Gallery as often as I could manage, stopping in to say hello to the presidents. The Air and Space Museum is staggering and the Mars rover photography exhibit is stunning. The main hall holds nearly every spacecraft I've ever heard of. I was happy to see a familiar name on the wall: "SpaceShipOne, a Paul G. Allen project." From the first private manned spaceflight to the oldest Elizabethan theatre in the United States; what wonderfully diverse hobbies you have, Mr. Allen. My trip coincided nicely with the cherry blossoms. I now understand why they are such a tourist draw. 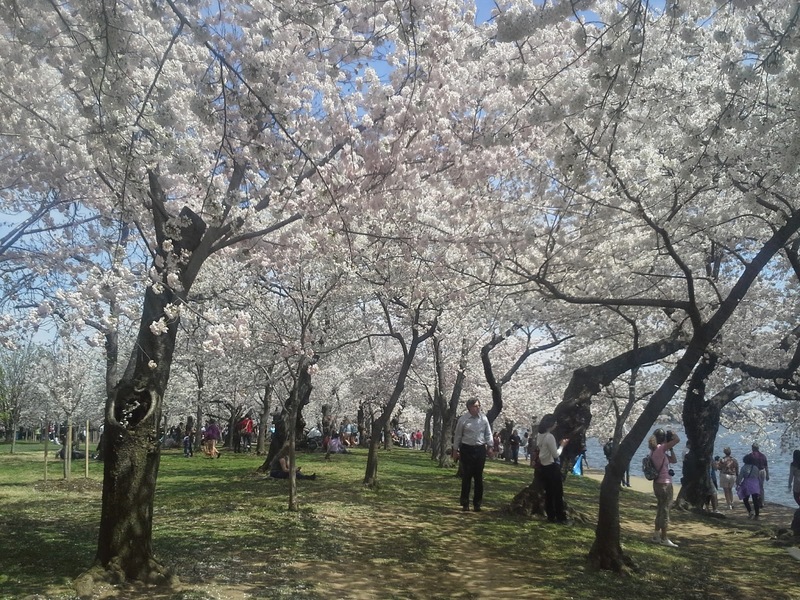 The tidal basin is so densely planted with them that the petals carpet the ground for days. They resemble the all-too-recent snow that district residence spent this winter cursing. Word to the unwise traveler: they'll set off allergies you never thought you had. To end my explorations, I'm currently on the train to New York City to see OSF's freshly Tony-nominated Broadway endeavor, All The Way. I'm curious to see the difference between a Broadway-budget set and the version I helped build a couple of years ago in Oregon. Then back to work at home, to finish up the last 5 shows of our season at OSF!